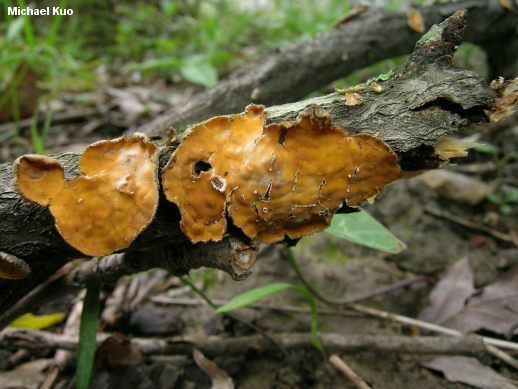 In the oak-hickory forests of central Illinois, Stereum complicatum competes with Gymnopus dryophilus and Ganoderma applanatum to be the most common, ubiquitous, ever-present, lost-all-its-luster fungus among us. Distinguishing features include the orange colors; the smooth underside that lacks pores; and the small, often fused fruiting bodies. 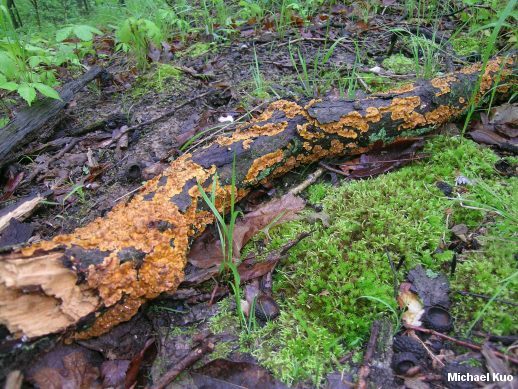 It is very close in appearance to Stereum hirsutum, but that species is yellow and brown, and slightly larger (however, specimens "intergrading" between the classic forms of Stereum complicatum and Stereum hirsutum are not uncommon, and some mycologists treat them as versions of the same species). 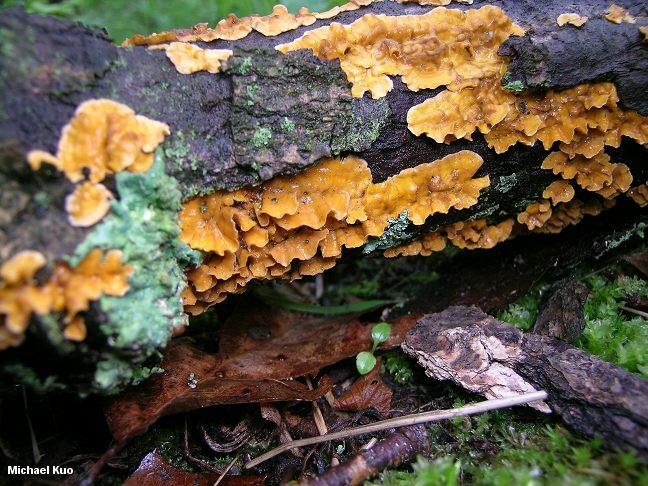 Stereum rameale is a synonym. Stereum complicatum, Stereum hirsutum, Stereum gausapatum, Stereum styracifluum, and Stereum versicolor are all members of the Stereum hirsutum group, and are considered forms or varieties of Stereum hirsutum by some mycologists. Ecology: Saprobic on the dead wood of hardwoods, especially oaks; growing densely gregariously, often from gaps in the bark; fusing together laterally; causing a white rot of the heartwood; often serving as a host to algae; sometimes parasitized by jelly fungi; spring, summer, fall, and winter; widely distributed in North America but apparently absent in the Rocky Mountains. Fruiting Body: Individually up to about 2 cm across, but usually fused together; fan-shaped, semicircular, irregular--or not infrequently resupinate (lacking a cap structure) to effused-reflexed (resupinate with a folded over edge); densely velvety, hairy, or with appressed hairs (sometimes nearly smooth in age); with concentric zones of color and texture; colors ranging from tan to orange-brown, pinkish, or cinnamon; laterally attached, without a stem. Chemical Reactions: KOH red (or at first red, then black) on upper surface. Microscopic Features: Spores 5-7.5 x 2-3 µ; smooth; cylindric; amyloid. Hyphidia with rounded to subacute apices; without projections (pseudoacanthohyphidia and acanthohyphidia absent). REFERENCES: (Fries, 1828) Fries, 1838. (Saccardo, 1888; Welden, 1971; Chamuris, 1985; Phillips, 1991/2005; Lincoff, 1992; Metzler & Metzler, 1992; McNeil, 2006; Miller & Miller, 2006; Binion et al., 2008.) Herb. Kuo 04270708, 05040705.